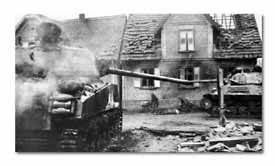 Meanwhile, at Oberhoffen heavy fighting had been going on continuously since the first entry into town, February 1. The northwest corner remained to be cleared when the Ist Battalion, 142nd, came back to Oberhoffen on February 7. For two days Company C aggressively hammered out gains in an action that won it the Presidential Unit Citation. 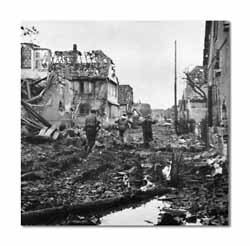 Into the flattened, rubble-strewn blocks of this section the Germans poured hundreds of reinforcements in a vain attempt to alter the decision. Company I made a river crossing north of Oberhoffen on the night of February 9-10 to strike at the German resistance from the rear. 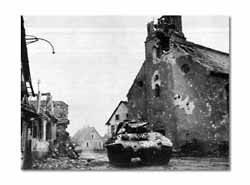 Company I had not linked up with the friendly elements in Oberhoffen when the Germans, on the hazy morning of February 11, committed a fresh battalion with three heavy self-propelled guns in support and sliced through Company E positions in the center of town. Bounding back and attacking from two sides, the 2nd Battalion nipped the German success and cut the enemys escape routes. 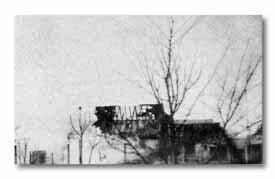 Two of the SPs were knocked out by infantrymen with bazookas. The same day Companies I and L linked up, erasing all enemy holdings in the north. More than 200 prisoners were taken on this one day. The German 257 VG Division in seven days commitment at Oberhoffen lost over 500 men and two battalion commanders to Division prisoner-of-war channels alone. Infantrymen move "on the double" as they pass KO'd tank during their advance through Oberhoffen. After 48 hours of continuous fighting within Oberhoffen, men of 1st Battalion, 142nd, welcomed relief. 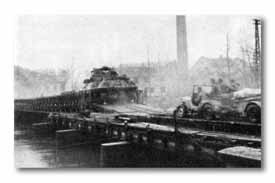 Germans fired heavily at the bailey bridge linking Bischwiller and Oberhoffen but it remained intact. Throughout another month the 36th held a static defense line along the Moder River from Oberhoffen to a point west of Haguenau. Extensive patrolling, often resulting in sharp clashes, featured this quiet period. Regiments were rotated for rest behind the lines. The Engineers busily laid mile after mile of board planking to keep the flimsy road network open. Artillerymen conserved their ammunition requirements as they did not have as many targets to shoot at. After dark a pattern of blue-white searchlight beams hung out over the front. Bright colored flares sometimes punctuated the stillness of the night. Within Haguenau, C Company, 143rd, crossed the Moder on March 3 to secure a small bridgehead. 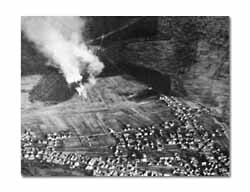 In heavy fighting eleven houses were seized before the company was relieved by the 1st Battalion, 141st. In violent counter action the Germans forced evacuation of nine of the buildings. But by 0600 of February 7 all the houses were retaken and the bridgehead became a stepping stone for the next major attack. Oberhoffen yielded a large number of enemy prisoners. Germans had to be dug out of cellars at bayonet point or flushed out with grenades. The two pictured above surrendered only after they had received this treatment. Smoke from a German mortal shell envelopes an already battered house in the town. The enemy took full advantage of the wooded area north of Oberhoffen to launch his counter measures. Despite artillery concentrations and bombings carried out on their positions, the Germans attacked from the woods to overrun the northeastern and central portions of the town on February 11. (Below) With an American tank still burning in the foreground, two litter-bearers pick up the body of a dead American. In the bitter battle for Oberhoffen two individual actions were cited for the Nations highest award: 2nd Lt. Edward C. Dahlgren, a T/Sgt. at the time of his action, destroyed two German machine guns, killed at least eight of the enemy, wounded an unknown number, and captured thirty-nine in leading his platoon to rout German forces which had penetrated the northwest corner on February 11. Sgt. Emile Delau, Jr., a squad leader, during the first attack for Oberhoffen, rushed an enemy-held house to capture ten Germans, later took two snipers. The following day, he silenced a machine gun after crossing a fire-swept open field. A few minutes later, as he worked his way toward another strongpoint, Sgt. Delau was killed instantly by enemy fire. 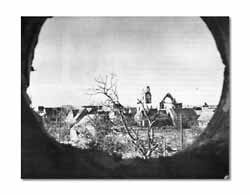 Attack on Herrlisheim by 141st was thrown back, but Germans were eventually forced to evacuate it. Rohrwiller was taken by surprise by the 143rd Infantry. T-Patchers found radios still playing. 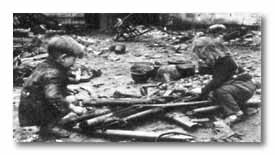 Two children, too young to realize the wrath of war, calmly play with German "toys" left in their yard at Oberhoffen.